In September, we celebrate Constitution Day, the day the Constitution of the United States of America was signed by delegates representing the 13 states. After it was ratified in 1788, Congress chose March 4, 1789, as the transition date of governing under the Articles of Confederation to the Constitution. 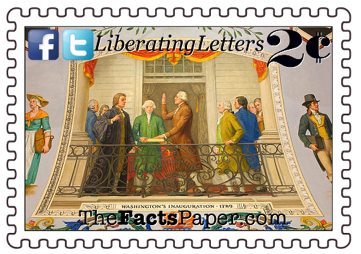 On November 15 1777, the Second Continental Congress approved the Articles of Confederation. It took until March 1, 1781, until all the states approved the document and it became the law of the land. We think today’s government has gridlock and takes forever to act, and they only had 13 states at the time! Congress, still acting under the Articles, elected George Washington President of the United States and John Adams Vice-President on February 4, 1789. When the new Congress began arriving in New York on March 4th, it was another month until enough members assembled for a quorum to make a final vote for Washington and Adams. Even though Washington wasn’t inaugurated until April 30th, the presidential term officially started on March 4 and remained there until 1933. The Constitution instructed Congress to meet at least once a year, on the first Monday of December, unless another date was chosen. The 3rd Congress chose December 1st, but March 4th, continued to mark the last day for two-term Congressmen. With elections being held in November, waiting until March to swear in new members allowed for an extended lame duck session for a Congress still charged with doing business. Some congressmen took advantage of the lame duck time. Many of those not re-elected pushed through legislation they would have otherwise avoided. We still see that today as people hold their breath when Congress reconvenes in Washington every December after the elections. In December 2014, Republican leaders worked against their party but with President Obama to push through a massive spending bill. It took less than a month for Republicans to renege on their campaign promises and stab their constituents in the back. They not only got the bill through before all the new House Republicans were sworn in, but before the newly elected Republicans could take over the Senate. In the elections of 1800 and 1824, when the electorates failed to give enough votes for a president, House members who lost their seats were allowed to vote on the next President. This gave ousted Congressmen the ability to still formulate the direction of the country for the next four years. There were other drawbacks from this overly long lame duck term. After Abraham Lincoln was elected in 1860, seven southern states exited the Union before he could take office on March 4th. President James Buchanan and a fractured Congress were void of any effective actions to stop the departures. By the time Lincoln was sworn in, the lines were drawn and Civil War was inevitable to preserve the Union. It wasn’t until the early 1930’s did Congress finally decide that the date for incoming/outgoing elected officials should be changed. During the Herbert Hoover administration, Congress drafted and passed the 20th Amendment but it was not ratified until after the 1932 election of Franklin D. Roosevelt. This Amendment moved the President’s inauguration to January 20th and Congress’ first day to January 3rd. Since the ratification didn’t occur until January 23rd, the changes were not effective until the 1934 election of new House members. Franklin D. Roosevelt was the last president to be inaugurated on March 4th in 1933, and he was the first president to be inaugurated on January 20th in 1937. So in this very heated, unpredictable, frustrating election cycle, it’s good to remember that these frictions are nothing new. Thomas Jefferson and John Adams had a very nasty campaign. (see A Dream Within A Dream) John Quincy Adams and Andrew Jackson also had a very contentious election resulting in the death of Jackson’s wife. (see History Rhymes Again) The Whig party disappeared because of their complete betrayal of their voters and as stated before, politicians use lame duck sessions to push through legislation they know is unpopular. Of all the systems in the world, though, our Republic has been the most generous, most prosperous, most charitable and most liberating to all it’s citizens as well as other nations. That is why I will continue to march forth for her, praising what she’s doing right and helping correct the issues she has. I will continue to uncover the history of America and recount the stories of what made her great. I just pray there is still a Republic left to give you, Liberty, once the establishment in both parties get done with her.